England is often called the “mother of democracy”. Our former rulers don’t have a Constitution. Till about 2009 they didn’t even have a Supreme Court. They have managed a democracy pretty well without a Constitution. We borrowed their parliamentary system, retained some laws from Jurassic park and we borrowed the concept of Constitution from others. The ones who scream most about democracy in India are usually the ones who hate it the most. Was Dhirubhai Ambani an Aam Aadmi? When he was a gas-station attendant he could be called one but once he built his business and became one of the richest men in the country he ceased to remain an Aam Aadmi. The same is true for all the people you see in the pic above. Some are politicians, some are political-brokers. Most of them also have a shared resume of suspicious foreign funding whose interests aren’t exactly transparent. Kumar Vishwas claims he worked his way up in life earning Rs.100 for some shows. His climb is admirable but now that he stays in a 7-room bungalow, does he still qualify to be called Aam Aadmi? Absolutely not! Same is true for Arvind Kejriwal, Ashutosh, Yadav and the rest. The possible exception could have been Binayak Sen but he’s actually “special” because he’s a convicted criminal. The lies of Ashutosh claiming to be a journalist already stand exposed. There’s another guy called Punya Prasoon Bajpai who claims to be a journalist but was caught sleeping with AAP. I guess it’s not hard to identify the other closet AAP members who still pretend to be journalists. 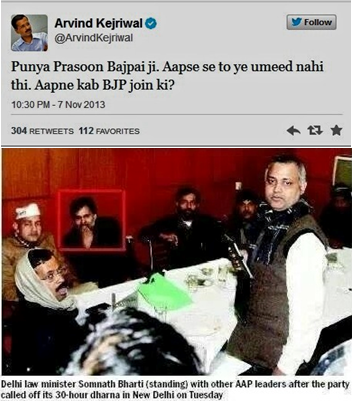 The deception of AK is evident by his tweet to Bajpai. He claimed Bajpai was batting for BJP while in truth the guy was sleeping with AAP and AK probably knew it. This same AK claimed Congress had spent 1400 crores on the media to damn them when almost the entire media was batting for AAP in the hope that they can deliver a final “Blow to Modi”. All the crooks haven’t managed it so far so they will have to try some new tricks. Latest allegations are that AAP offered money to write positive posts about them to a Pune writer. What comes through clearly is that both AK and AAP are a big front for the Congress and their deceptions have been cleverly peddled by the CNN-IBN group, Aaj Tak, Headlines Today, TOI group and quite a few other media dealers. On January 23 (on his election tracker show) a panellist, Manini Chatterjee, stated this bluntly to Rajdeep Sardesai. It is important to ask, therefore, if these guys are really Aam Aadmis. Claims of representing the Aam Aadmi when these Commies and Maoist-sympathisers are actually fooling them now stand exposed. Each person in the Commie gallery that appears earlier in this post has nothing in common with any Aam Aadmi. The great Commie ambition is to overthrow democracy and establish a system where their members alone will dispense instant justice on the streets or wherever they are. Ask CPM, they know all about it. They want to make laws that will suit themselves and not democracy. I have long maintained that our MSM itself is infested with Commies and anti-nationals of all kinds. They find it easy to fool people because people have been fooled for ages by the Congress+Commie combine. Let me quote again “People don’t drink the sand because it quenches their thirst, they drink the sand because they can’t tell the difference”. It is this helplessness coupled with ignorance that is the prey for anarchists of the AAP variety. I have little doubt that this AAP gang is nothing but foot-soldiers for the Congress which is well-aware of its possible death in the general elections. The history of Commie Congress and their other Commie friends is one of destroying democratic processes; not nurturing them. The founders did not want an efficient government. They feared tyranny and created a regime that made governance difficult. Power was diffused among local, state and federal governments, each with their own rights and privileges. Even the legislative branch was divided into two houses. It was a government created to do little, and what little it could do was meant to be done slowly. The founders' fear was simple: Humans are by nature self-serving and prone to corruption. Thus the first purpose of the regime was to pit those who wished to govern against one other in order to thwart their designs. Except for times of emergency or of overwhelming consensus, the founders liked what we today call gridlock. At the same time, the founders believed in government. The U.S. Constitution is a framework for inefficiency, but its preamble denotes an extraordinary agenda: unity, justice, domestic tranquility, defense, general welfare and liberty. So while they feared government, they saw government as a means to staggeringly ambitious ends -- even if those ends were never fully defined. … The founders needed to bridge the gaps between the need to govern, the fear of tyranny and the uncertainty of the future. Their solution was not in law but in personal virtue… Their Senate was both a Roman name and venue for the Roman vision of the statesman, particularly Cincinnatus, who left his farm to serve (not rule) and then returned to it when his service was over… They also wanted virtuous rulers… It is the virtue that most reasonable men would see as praiseworthy: courage, prudence, kindness to the weak, honoring friendship, resolution with enemies. These were not virtues that were greatly respected by intellectuals, since they knew that life was more complicated than this. But the founders knew that the virtues of common sense ought not be analyzed until they lose their vigor and die. They did not want philosopher-kings; they wanted citizens of simple, clear virtues, who served reluctantly and left gladly, pursued their passions but were blocked by the system from imposing their idiosyncratic vision, pursued the ends of the preamble, and were contained in their occasional bitterness by the checks and balances that would frustrate the personal and ideological ambitions of others”. People like Arvind Kejriwal and his gang (as also the Congress party and the Commies) do not like these checks and balances. Their bitterness spills on to the streets. They will do anything and everything to have their way even if it means disrupting your lives and destabilising our democracy. It’s another R-Day celebration and a celebration of our Constitution. However weak in some areas our Constitution maybe, we do not want fake Aam Aadmis pretending to be revolutionaries. At the very first opportunity, after being elected, they abused their positions and the Constitution. The only place for elected representatives to seek change is through the Assembly or Parliament. Even before AK and AAP have started doing any good they have already started destroying some of the best things about India. These guys neither understand democracy nor do they respect it. More importantly, these fake Aam Aadmis neither understand governance nor have the skills to deliver. PS: Please vote on India's worst journalists poll (Right margin of this page). Brilliant article as usual. The stratfor article is also profound. The rediff article http://www.rediff.com/news/slide-show/slide-show-1-mapping-the-aap-shock-win-in-new-delhi/20140121.htm busts the MSM claim that youth voted for AAP. Why can't social media exposure of Bajpayee and others force these media house to come clean. There should be aggressive campaign on twitter etc to voice the protest and expose these frauds. Another brilliant no-nonsense article. And it is the commies in media that are supporting and sustaining it. And it is impossible to have a sensible debate with them. Neither can one ever win over those in any debate as these are lunatics . nothing is sacred nor sensible to them. Everything is expendable in their pursuit of power. In a way these do share some attributes like crass opportunism, self righteous indulgence , extreme selfishness with capitalists and hedonists. It is equivalent of a pig slugfest when someone takes them on. The combatants get dirty, but the pig enjoys more. I was wondering if you have ever tried MSM to publish any of your blog as guest journalist. I feel you should give this blog to Times for publishing and see the reaction. 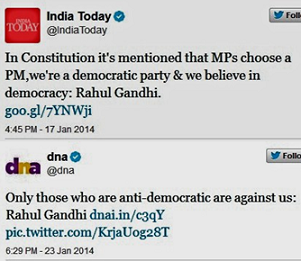 Do you think that ToI have not already read his blogs? They have, indeed. But their designs are not aligned with the hard facts on the ground that form the subjects of Ravinar's articles. I think Social Media's reach among the youth is more instant, far-reaching and "damaging" as compared to MSM. Ravinar...what you are doing needs an analytical mind, reading between the lines, separating wheat from chaff, courage and conviction. You are one of the reasons I am still on Twitter. Keep it up. But for you and your articles, I would have found it difficult to discern between the losing party and its proxies. Ravinar's blogs have to be "found" by the people who really search for the truth. His material cannot be shoved down anyone's throat using MSM. You see, people have to be ready to hear what has to say. For example, I had lost faith in our media quite a while ago. I knew they were lying through their teeth...but I did not have all the pieces of the puzzle that Ravinar's blog helped me find. So with other people. I have tried to get people to read his blogs...only those people who are ready to "handle the truth" so to say, lap it up instantly. Ravinar if you look at the number of PhD program offered by College of Arts in USA it gonna be in thousand. Almost each school will have atleast 10 to 15 PhD students. All these PhD students require atleast one problem to do their thesis on. Like in our field (Engineering) there are tons of problems on which we can do our research and we don't need to go abroad for it whereas there are not lot of problems these graduate students of Arts can find in USA only. Like in our area, funding agency give our professor funding to hire graduate students to work towards the assigned problem. Similarly, agencies like Ford Foundation give funding to people likes Arvind Kejriwal, Aruna Rai to create problem in their country so that the graduate students in USA can do their experiment on these problems and do their thesis. Let's say in a big public company there is a canteen which is poorly run. Say a fresh employee sees the mismanagement and starts shouting in canteen daily. His colleagues take note of him and believing him to take care of canteen affairs (very important for the colleagues daily lives), they get him promoted as the head of the company. This guy now grapples with a list of issues where he has not put in any thought, and suddenly starts missing his canteen shouting days. So, since he is the CEO of the company, he thinks he owns the canteen as well, he goes and start shouting again. The canteen management (and the customers) cannot wish him away now. The food doesn't change much since the basic issues are unsolved. The company is left rudderless. The fresher is utterly confused why this is not working anymore. This - I think is the story of current AAP. Let's put it in right perspective. Kejri is a former IT commissioner. He is trained to be suspicious of everybody. The job requires a certain level of thick skin and an imposing attitude. The IIT degree (I am an IITian myself), gives him the false confidence that nothing is rocket science - especially governance. He is the famed "Pandit Ji" in the class. Every batch in IIT (and probably other engg colleges) have such guys. Outspoken, opinionated and highly articulate in a rustic manner. These are the guys who can sell ice to eskimos. But typically poor on grades and classwork. They typically end up in govt. services or in politics. Kejri is important since he shows what is possible in Indian politics. May thousand new AAPs bloom in this country. But this particular aap needs to be swept away. By a broom! Don't accuse AK of honesty. That's a vice he doesn't have. AK never started with an intention of cleaning anything. He just wanted to realize his ambitions. Ravinar has already pointed out that AK never completed anything he started. I agree with you regarding honesty of Mr AK, convinced especially after drama enacted when IT deptt asked him to payback the salary he collected shamelessly,illegally and immorally. My "sources" in IT deptt told me the rumour is that, as IRS person, he made a list of HNI people and shared this list with Mr Dixit to extort money for war chest of 1998 Delhi polls. The superiors resented his non-conventional approach of extortion, like even if IT assesse is not under his jurisdiction he will ask them to donate certain NGOs for no further harrassment. They heaved a sigh of relief when he went for study leave and never joined back. Can we run a focused campaign against Paid Media using a common hashtag and build up the momentum around this? I am guessing the MSM is going to become more and more biased as the elections near. We need to be focussed and work together to thwart their attempts as well as expose their designs. I propose #IHatePaidMedia as the hashtag .. what say? anybody noticed?in the youtube(Sponsored revolutions) video 20.10 second the Revolution trainer says about his game.he says his game has levels the easiest level is "fight against corruption" in the game and the highest level in the game is "fight against dictatorship" .Fight against corruption ring a bell !!!! this article is truly a republic day gift from ravi !! Another excellent thoughtful article ..! Ravinar ,Yesterday I saw few MC fans from Newzeleand showing poster of Mediacrooks on cricket ground. Same way it will be great if you allow readers to have a sticker like thing on our car/bike/any other thing that can be used for publicity. This will be another good way to reach maximum readers. Also as somebody have already suggested to have a Facebook page which will be instant hit idea for reaching more people. 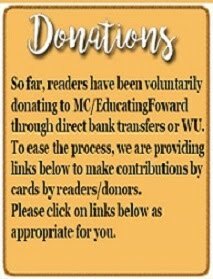 Pls pls give a serious thought abt it and let readers of this blog do a small contribution from their side. Very well said. I know, you always say it very well and it is a repetition to say it yet again. But the efforts you put in every single article are truly laudable and hence - respect! I think all ancient successful systems of governance did exactly that...distribution of power and resources, so that no single group became very strong and controlled everything. The classic grid-lock. AAP in articular and Congress in general offer "quick-fix" short-cuts and appeal to exactly the kind of people who are too lazy even to think things through. We all know that to build anything worth while takes unglamorous, persistent hard-work with a single-minded resolve. Intellectually lazy people don't have the patience for that. Hence the Maggi 2 minute solution to all systemic problems appeals to them. People seem to be more scared of freedom than of servitude...because free people have to think, they are responsible for their actions and they have to face the consequences of their decisions. Servants can do as told and complain happily over a mug of beer. That is exactly the kind of people who support these "revolutions". They are blind followers, the only change being they want to follow a new master now. Thanks for your voice of reason! When Taliban first came to Afghanistan/FATA province, they came in as agents of instant street justice. They used to conduct panchayati justice and criminals were punished by early Taliban bypassing law and order machinery. People cheered on when they saw criminals and thugs being punished by instant Talibani judiciary delivering quick justice. It was only later as per the design that they brought the whole area under their control and we all know how Taliban is now. The people who cheered Taliban in it's early form look and resemble the same Indians who are now seen cheering for AAP in all of the AAP's idiotics. I voted Arnab Goswami as the worst journalist. He runs the most watched programs & pretends as if he is neutral, his channel i credible compared to others. On the measure of threat to the nation, he ranks the first. Every vote on Arnab Goswami, you should count it as 3 because of his high TRP ratings. He supports AAP & hence the national threat is further increased. He is staging interview with Rahul Gandhi with an agreed script. So Arnab Goswami is the worst of all forgetting the polled numbers. 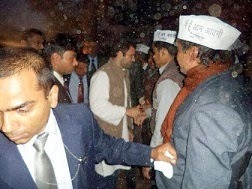 Even if it was staged, it completely exposed the inadequacy of Rahul baba. He was stonewalling (like most of his stooges anyway) to any question by giving a bunch of BS, irrelevant and incomprehensible replies. A much touted interview, it fell on its face like a nervous schoolboy in a university viva exam. the aam aadmi party represents the dark side of human nature - they are possessed with an instinct to decry , defame and destroy all that is sane and orderly . the really vicious ones amongst them is the combo of dr jekyl and mr hyde - yogendra yadav and ashutosh . 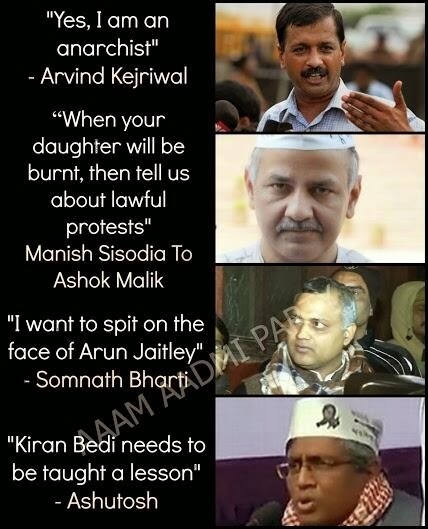 these along with that eternal anti national prashant bhushan are the true puppet masters of kejriwal and bharti. kejriwal is a true willing idiot though .in a perverse manner though one can rely on his bloated ego to come up with something horrendous to thwart the evil machinations of the evil trio. As confirmed by the photo given, facial expressions of Kamal Mitra Chenoy and Meera Sanyal are permanent, they just do not change. excellant article. would like to share with my friends. There was an internet meme comparing Kejriwal with Bane from the Dark Knight Rises. The other day I was watching the video clip of Bane's speech at Blackgate prison. Although I have watched it multiple times, recently I watched it with the latest events in mind. The resemblance between Bane and Kejriwal is hard to miss (not the physical resemblance, of course). How Bane talks about delivering Gotham from the corrupt, how police will serve real justice and all that. Now, what really surprised me was the comments section. There were so many comments that wanted a Bane-in-Gotham like scenario for their own cities. Someone even said, that s/he loved the scene where a street thug was dragging away the "rich broad". And that moment - when I read that -I realized, no matter how much you show the mirror to the AAP supporters, they will not care. For they think that they are idealists just like Bane is. Their idealism is the same as that of the foot-soldiers of Mao Zedong during the Chinese Cultural Revolution. Or that of the Naxal movement. They will think Bane as the real hero. Class warfare is an approved method. They will never look at history and they do not have the patience/intellect anyway to read and understand history. But what surprises me is that they do not even understand what happens to Gotham in the movie. Probably they think they will all be safe in Bane's Gotham, since they all think they are the Aam Admi, Bane/Kejri is fighting for. That much is their understanding of the movie and our reality. These Aam Admis who work in MNCs and earn a huge salary and worry mostly about how to spend their money on the weekends, think that once they spend a few weekends protesting on their streets and eliminate "corruption",they can go back to their previous cozy lifestyle. Unfortunately no one has explained to them, that Kejri is planning to destroy that society that gives them their cozy lifestyles, just as Bane destroys Gotham in the end. Just like the youtube commentators who think they are Bane's army, just like nice kids who think they are qualified to become street-thugs if they speak a few street slang, just like white kids who fake as "niggas" by speaking "ebonics", our AAPians think they become the Aam Admi by donning AAP caps. You should write something about these useful idiots too. Excellent point. I was afraid of this since rise of this AK. Always frustrated and cynical. Very much the same mentality as Bane. This is how Communism work and in the school it was taught like this; A communist leader gave speech to mill workers that he would make everybody equal. Mill workers saw themselves in line with the Mill owner, but when they woke up, they were in much poorer shape in line with much poorer people. Mill workers' contribution brought up poorer people in line with the mill workers. "If we wish to maintain democracy not merely in form, but also in fact, what must we do? The first thing in my judgment we must do is to hold fast to constitutional methods of achieving our social and economic objectives. It means we must abandon the bloody methods of revolution. It means that we must abandon the method of civil disobedience, non-cooperation and satyagraha. When there was no way left for constitutional methods for achieving economic and social objectives, there was a great deal of justification for unconstitutional methods. But where constitutional methods are open, there can be no justification for these unconstitutional methods. These methods are nothing but the Grammar of Anarchy and the sooner they are abandoned, the better for us." Politicians, bureaucrats, police, and judiciary should operate independent of each others for successful governance. The moment politicians like Bharati decides that cops should be subservient to cops, a democratic institution is destroyed. Aaptards want instance justice, but it should be the US way of checks and balance and not the Khaap way. AK, use anarchist methods as a last resort when all constitutional options have failed. Anarchy should not be the first option. I was also a fan of AK before realizing he was- Megalomaniac, inflexible, anarchist rather than being solution oriented, commie, Populist,manipulative, anti BJP. There are lot of admirers of AAP and their form of politics but would like to say that AAP hasn't did anything new in Indian politics. It happened in past as well. I have to bring the facts about Assom Gana Parishad; their struggle and success in Assom. They were really AAM Admi, mere students and they did better than these AAP jokers. All media appreciates AAP about their phenomenal victory (29% of voted votes) but for me AGP leaders were far better and effective than these anarchists. Anti-corruption was always an issue in politics, some time it was in background but there were a lot of the movements on this issue. It is not that only AAP has started any thing new by agitation on this. I still believe that Nav Nirman Andolan in Gujrat which led to Emergency is the biggest movement in history of India. Even VP Singh episode started on corruption only. But blinded by their own ignorance neither media nor supporters of AAP are ready to accept it. I really appreciate, your effort in putting this blog together. I am not in politics, neither interested. Just came across your blog shared by my friend. I am putting my thoughts about this blog across to forum here. Regarding your claim that AAP & co are fake AAM AADMIs and people like Dhirubhai Ambani are AAM AADMI and etc. 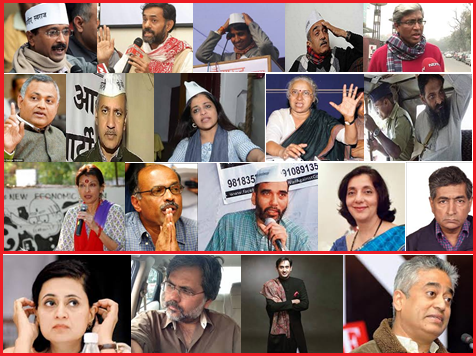 How closely have you dealt/know with these people (both fake and non fake AAM AADMI) ? Do you know how Dhirubhai made Reliance such a big company? What all steps he took to achieve success? How this AAM AADMI is helping/has helped in solving common man's issues? If someone lives in a big property, does not mean that he is not AAM AADMI. Everyone has means of earning based on their capability and by virtue of knowledge they hold. Why can't you try to do something which AK & co is doing? Rather than spending effort in writing blogs to criticize people and their policies. Why can't you take steps to bring like minded people together to fight against people you are criticizing and try solving issues(Education,Poverty,Healthcare, etc) of common man. Your comment is very typical of muddled mind which lacks comprehension. First of all you dont read too well. Does the post say Dhirubhai is an Aam Aadmi? I believe it doesnt occur to you that unless AK & Co. were "special aadmis" the police wouldnt have treated them the way they did. If you had been in AK's place, you would probably be in jail by now cooling your heels. If you have to wonder why I write.. I would have to ask a similar "stupid" question to you: Why do you waste your precious time reading this? This is a typical AAP-mentality that everyone should give up whatever they are doing and do something of YOUR choice? These kind of silly arguments from AAP have long been dealt with. Most of all, dont behave like you know what I do or do not do. Avoid making comments with such ignorance. Kindly read this blog again and again to get the essence of each and every word and it's context. In past 5 months I never found any instance where Ravinar did any criticism just for the sake of criticism. We may differ on many issues with Ravinar and I did, but one thing I am sure that he is exposing the MSM and commies with valid points and arguments and I appreciate it. Please create an appetite to digest criticism not reaction. Mr Ravinar has a point of view. I am not in agreement with all his points and views still I like his blogs and his writing style. Instead of answering to his "points of criticism" why one should worry about his "acts of criticising" some view. His point is simple " jo dikhaya ja raha hai woh saach nahi hai". The kid-glove treatment of Mr AK and murderous assault on Mr Ramdev , when both are having " anti-corruption agenda and peaceful fast/ satyagrahs. Is it someone else's fault that even after knowing this you don't want to acknowledge ?:. @ KP.. This AK & company had been forcefully removed by Delhi Police while agitating in front of Sheila D home before elections as all know..only because they were not MLAs and ministers at that time.. Thats what is point here..
KP, In a vibrant democracy, everyone has a role to play. Ravinar is playing the role of a journalist and is exposing the misdeeds of the government and the media to thousands of his blog readers. 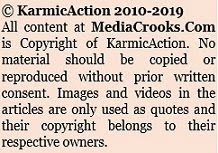 How else do you think the common people would know about all this tricks played by the MSM, if people like Ravinar stop writing and instead start doing what you are suggesting. Just like we need politicians to run the country, we also need good journalists to keep a check at them. We need to appreciate Ravinar for the good work that he is doing. Your suggestive logic of not to criticize others does not hold good, because you yourself are behaving like an arm-chair critic. I would add one more comment in Ravinarji's reply to KP. Remember what had happened to Ramdev's supporters at midnight where police brutally attacked with tear gas and lathi-charge, where one woman lost her life. Whereas for these special AAM AADMIS government issued an order to go soft on them. For the first time probably you wrote about Punya Prasun Vajpai. Everyday at 10 PM he starts his anti Modi program for 15 minutes. He tries to link Modi to all kinds of issues. I watch his antics every week day. Thanks for exposing this guy. Yet another brilliant article by MediaCrooks....AAP got lot or criticism on the Dharna. But what revealed is their intolerance to digest the critics. They went to any extent to silent the voices of celebrities. In fact threaten them to teach them lesson on street. My Tweeter handle got suspended due to I sent a tweet which criticized their Dharna. Three accounts suspended so far! Well written once again. It's unfortunate that a large populace (especially the so called educated ones) don't have any idea what democracy is, nor know the importance of politics or have studied it thoroughly. They don't bother to read history or understand human nature and don't have an idea how complex governance is. They think it's like instant food and immaturely cheer dole outs, instant justice etc. Hiding under the garb of political correctness and inflated ego's they fail to think what their actions will give rise to. Personally they are self serving and do nothing to alleviate the suffering or correct the wrongs and expect others to do that sitting in their A/C rooms. It's these people and their ignorance which self serving, murderous & destructive individuals capitalize upon in the name of revolution. They say history repeats itself and it repeats with a vengeance on those who fail to learn from it, unfortunately that's what I see is happening to my dear country. I would like to repeat Mortov's words to a blind Bolshevik supporter after the October revolution: 'One day you will understand the crime in which you are taking part.'. I know it won't make any impact to brain dead supporters of the latest Maoist outfit. As Yuri Bezmenov says even if you show them the truth or provide facts they will refuse to accept it as they are brainwashed (and in many cases self brain washed). The so called young generation of India have zero knowledge of politics, human nature, economics or governance. They are neither aware of the complexities of governing nor know that all these are interrelated and come into picture while ruling a country/state or city. Having grown up on Instant food, easy money, comfortable life and Bollywood/Tollywood entertainment, they think they know everything by being on Twitter/Facebook & blindly believing what the charlatan Indian media dishes out. Its hard to expect a positive change from such folks and their ignorant parents who were more or less content in a kleptocratic environment. The great Kannada writer Dr S L Bhyrappa had written a similar article few years back in Kannada Prabha eulogizing George Washington & highlighting the point of how he was reluctant ruler refusing to continue for a third term as it would set a bad precedence & lead to power mongering and corruption, when writing about the power hungriness of Nehru. After reading that article I thought what a visionary and gentleman George Washington was. Alas my country fell into the hands of power hungry megalomaniac. He & his family have lead it to ruin. This article made me remember that. Thanks for brightening my Sunday . Dr S L Bhyrappa articles are an eye opener on Socialism, duplicity of Nehru - Indira Gandhi & the havoc their bad policies had on India. I appreciate your view and concur it. Thanks for putting it here. http://www.youtube.com/watch?v=Igpzdog-bbs&feature=share. When people have no idea of Republic, it is too much to expect them to know about democracy. Most worrying part for me in AAP is, almost all new members with political profiles joining AAP are communists. And i dont understand how a communist can claim to be democratic. I was a supporter of AAP but when AK has taken support from cong and when AK asked Harshavradhan to give evidence against Sheila Dixit to file case (Before elections AK always shouted that he has 370 pages of proof against her) he proved that he is a big liar. Thanks ravinar for sharing the link on sponsored revolutions. Excellent. Given many similarities and usage of symbols there remains not even an iota of doubt as to who all are behind AAP. ( anti India forces ). Many of the foolish AAP members, spokespersons and supporters may or may not be aware of this. It is a must watch for all including the intellectuals of bjp who may be visiting this blog , if any. Wonderful Ravinarji....I researched on some techniques and methodologies adopted by AAP. They are remarkably similar to Arab uprising. However, there is a basic contraction in what AAP is doing. The Arab uprising or Serbian uprising was against the dictators. Where as here in India, they are fighting against the democracy to impose Yogendra Yadav, Medha Patakar, Binayak Sen and Arvind Kejriwal's version of communism which is left of left to Congress. Even Popovic of Serbia, acknowledges that organizing popular demonstrations by non-violent protests, throwing out a dictator is first part of the struggle but building up Democratic institutions is the toughest job. Here AAP is trying to demolish Democratic institutions that are already present on the ground to further their failed and discredited communist agenda hiding behind the popular discontent. And that is the BIG Contradiction and that is why we see them failing in using, strengthening, Existing Democratic institutions to offer better governance. I feel it is sad that while India has to focus all its energies in rooting out the corrupt congress Govt, the Media & especially the IBN group is busy trying to divert the attention of people into an imaginary AAP versus BJP fight thus confuse voters into wasting their votes. I also request & pray that BJP supporters do not fall into this trap set by AAP-Congress & waste its energy into a useless dogfight with AAP. I am happy to see BJP avoids talking about AAP even if Media provokes it all the time. “The possible exception could have been Binayak Sen but he’s actually “special” because he’s a convicted criminal. "- sentenced to 'life imprisonment' for treason by chattisgarh session court. granted bail by our honorable(!!!) Supreme Court. And,Katju was one of those judges who granted bail. immediately inducted into planning commission. Now any one of these three is the culprit here – investigaing agency, judges of chattishgarh session court or supreme court judges. I am not including congress here as people have innumerable comments for them already. Why is SD's name in the list? I truly appreciate you for your research and your way of writing. I have become a big fan of yours and don't miss any of your blogs. I miss on days when you don't post your blog. Why don't you write everyday ? (Although i understand that research does take its time). You are a true national. I am a big fan of Shri Rajeev Dixit ji but sadly he is not with us anymore. After reading your blogs, i feel that the void left over by Rajeevji's demise is being fulfilled by you. Please carry on with your good work. Thank you for sharing the wonderful information about democracy basics and sponsored revolutions . Great article overall . You have exposed crop of these imposter Aam Adami. But important question is how these thugs and their destructive design are unmasked. Because in prevailing situation sizable section is foxed by these loud mouth by their continuous pretensions that their every actions and acts are oriented to the welfare and interest of the people and nothing else and section of media supporting them. Their Modus operandi is no secret. But any true disclosure against these fakers will be viewed by their foxed follower with suspicion as propaganda against their messiah, so keeping in mind these BJP need to work out strategy. Great article ! Besides the obvious spectacles that we have been treated to in the past weeks, on a more general note - really wondering how anyone thought this concept of random personalities all coming together to pursue one stated common socio-political goal but by different paths, would work. Some are pious, some dictatorial, some opportunistic, many well intentioned, and some downright sociopathic. But all of them proudly and loudly an aam admi. Frankly, check out any sustained dialogue on any platform and you'll see no two average strangers getting along for long, especially if it relates to issues which are critical to their own lives. Any building society general body meeting, anywhere, would be a quick study in this. Imagine two regulars on twitter who have never met, trying day in and day out to out-talk, out-smart and prevail over each other in arguments about the state of this nation. And then one day, one of them joins the AAP and is now minister or a spokesperson. Is that really what people want? Here we have a bunch of randomly gathered individuals, mostly professionals, opinionated, motivated individuals trying to strike a path together, under an artifical banner but each a separate arrogant, self governing 'aadmi' as in one man, with no binding ideology, mutual history, belief or political mythology. Basically the idea is a non-starter, so full of contradictions since the name prioritizes the singular in pursuit of a universal good. Maybe they would have more success if they saw perceived themselves as 'Aam Log'.